For 40 years, Apollo 17 has retained the distinction as the last human voyage to the moon. Schmitt is still the 12th out of only 12 men to step foot on the moon and Cernan, as the last to climb up the ladder into Challenger, is still the final man to leave his footprints on the lunar surface. Before he took his final step off the moon, Cernan said, "America's challenge of today has forged man's destiny of tomorrow. And, as we leave the moon at Taurus-Littrow, we leave as we came and, God willing, as we shall return, with peace and hope for all mankind." Momentum is now building to return humans to the moon, both through government and commercial efforts. Schmitt says that if he had the opportunity today to revisit Taurus-Littrow, he would return to the site where he found the orange soil and then venture to an area where he and Cernan didn't explore. "I would want to go back to Shorty Crater and spend more time really trying to define the geological context of the orange soil that we found and sampled," the moonwalker told collectSPACE.com in an recent interview. 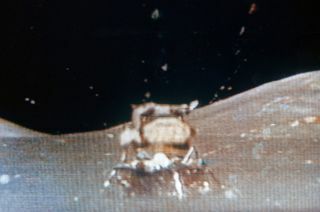 "The other thing though, would be to go to the area that was northeast of the landing site, an area we called the 'Sculptured Hills' and really try to traverse across those hills and gather as many different kinds of rock samples as we could possibly do," Schmitt said, explaining that the insight gained over the past 40 years now suggests the Hills may be "a very large, relatively coherent piece of deep crust" that was thrown from an impact basin. Ultimately though, Schmitt said he would look beyond his old landing site for the next steps on the surface. "Given the chance to go back to Taurus Littrow, I would probably argue that there are more important places to go right now, as we do have samples and observations from [there]," Schmitt said. "The thing I'd like to see us sample is the older [impact] basins. We know they are older but we do not know how much older they are."